Notes taken during a lecture or seminar are essential to the learning process and using linear and non-linear notes where appropriate is an essential study skill. 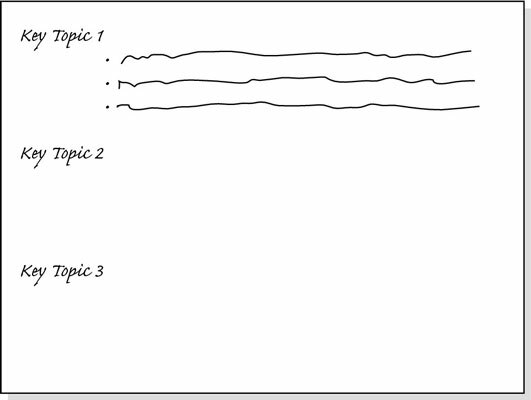 Linear note-taking is the process of writing down information in the order in which you receive it. Paper is itself two-dimensional so linear notes follow the natural sequence of time: page 1, 2 and so on, beginning, middle and end. Time order and page numbering can help you check something later, as your recall prompts are going to be in terms of time or sequence and position on the page. However, your brain is multi-dimensional, and the more links you can make to existing knowledge (by preparation, for example) and creating other links as you listen, the better you’ll have captured knowledge and made it your own. This also gives you multiple access points to that knowledge, instead of just two – time and space. Handouts rarely contain interesting anecdotes or examples, but they can be valuable as mnemonics, so a keyword or marker in your notes to remind you of an anecdote or example can be useful to help you recall the information or point with which it’s associated. If the lecturer doesn’t give out handouts, he’s likely to give the main points in the introduction of the lecture and then expand upon them with examples. 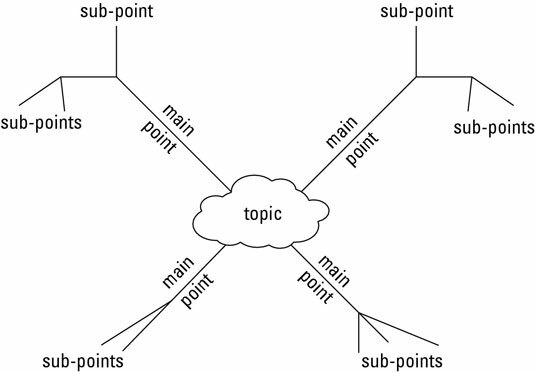 If mind maps are a step too far, you can note (or type) each main point from the introduction on a separate page and fill in the key points for each as the lecturer introduces them. Another way is to note down the key topics from the introduction and give each a number or letter to use later when they’re discussed in more detail . Doing so avoids repetition and saves time. Non-linear note-taking involves using mind maps or spidergrams that start with notes in the middle of a page, usually in an oval representing the subject, and then spread out with ‘legs’ making links north, south, east and west. You don’t organise such notes in time sequence but in terms of meaning, similarity or hierarchies of importance or association. They reflect the internal workings of your brain, rather than the external event, the lecture. Each time you get a new idea, your mind makes several links to your existing ideas, links that have not existed before. The more links you can make to existing knowledge (by preparing, for example) and then create as you listen, the better you will have captured knowledge and made it your own. This will also give you multiple access points to that knowledge, instead of just two – time and space. Occasionally, you’ll make bad links, for instance, if you mishear something the lecturer said – Napoleon’s mysteries or Napoleon’s mistresses, say – but you’ll be more likely to spot the problem and correct it if you use mind maps rather than linear notes. In order to take non-linear notes or mind maps you have to use additional sheets of paper at the top, bottom and sides so the notes extend onto them giving a holistic overview, which is easier to understand. Notes produced in this way usually look nothing like the lecturer’s overheads or paper handouts. They’re the interpretation of the writer, truly representing his understanding of how what he’s heard fits in with what he knows. He’ll also recall the lecture well for future use because he’s set up his own system of links and connections rather than using the time and space system of most lectures. However, they can take up a lot of space and can sometimes work better as a group project after the lecture, when everyone can contribute their understanding of the main points, and areas that are not clear. Some lecturers encourage participation in class by using mind-map and brainstorming methods, usually with one person noting the ideas of a group – a great way to try them out. Such notes can take up a lot of horizontal space, so it helps to have small writing and be neat! If you see someone using mind-map note-taking techniques in a lecture try to sit near him and perhaps compare his notes with yours over a coffee and chat. You’ll probably see he’s noted down less than you and can give a summary of the lecture without much head scratching. Notes aren’t a substitute for learning! But if you make notes creatively, and try different ways of taking information down, you’re more likely to find the method that best helps you to remember information when you need it later.